(CNN) - A Republican congressman and supporter of John McCain called a Spanish television ad from the Obama campaign "offensive and dishonest" Thursday, and said the Democratic nominee owes the Latino community an apology. "It is offensive and dishonest for Barack Obama to lie about John McCain's record on immigration and years of support for the Hispanic community, when it was Barack Obama himself who voted for 'poison pill' amendments that killed the effort at immigration reform. Instead of making false ads with baseless attacks, Barack Obama should be apologizing to the Latino community," Rep. Lincoln Diaz-Balart said in statement released by the McCain campaign. The Spanish-language ad, launched earlier this week, aims to connect McCain to Republicans who have staked out staunch anti-illegal immigration stances - including talk radio host Rush Limbaugh. "They want us to forget the insults we've put up with, the intolerance," the television ad's narrator says in Spanish as an image of Limbaugh is quoted saying, "Mexicans are stupid and unqualified" and "Shut your mouth or get out." "They made us feel marginalized in a country we love so much," the narrator continues. "John McCain and his Republican friends have two faces. One that says lies just to get our vote and another, even worse, that continues the failed policies of George Bush that put special interests ahead of working families." But McCain has repeatedly disagreed with his party's base on the issue of immigration and was a chief sponsor of an immigration reform bill last year that deeply angered conservatives and nearly sunk his campaign for the presidency. The Arizona senator is also no favorite of Limbaugh, particularly for seeming to take a moderate stance on illegal immigration. But critics note McCain shifted his own policy on immigration as the Republican presidential primary race heated up, advocating a "security first" approach. Limbaugh also took issue with the ad, telling the Politico it had taken his past statements - one of which is 15 years old - out of context and was an attempt at "race baiting." "Obama is now stoking racism in the country," Limbaugh said. "Obama is a disgrace - he wants the public to think he is Mr. Nice Guy while his thugs are in Alaska looking for dirt on Palin and he runs race-baiting ads and lies about what he has done and what McCain has done." People that write in comments should educate themselves before doing so. Typical Obama baseless, sound-byte ad. That right no way – those mexicans are sleaze bags. All of the no-tax paying illegals out of the country. This is very flawed logic. Even if McCain did the same thing (which he didn't), your argument is that he deserves it? And that makes it okay for Obama to do it? "What about the issues?" -you liberals ALWAYS complain, but cannot bring yourself to stand in any way against Obama. At least people on the right can disagree with each other in a mannered way. You are all hags who cannot see your own hypocrisies. I am a McCain supporter, but I can feel comfort to call him out when I feel he's wrong-that's the beauty of not being tied down and blind like all of you yes-mans are. Ah, Rush, aren't you the same guy that launched into Chelsea Clinton? Thugs in Alaska? What about the Swifities who lied their way to fame and later into trouble when they got outed?! And Rush, what about the Oxycontin and trips to the Dominican Republic – care to comment?! So i guess everyone can shut up now about lies and negative campaigning. If McCain is going to confess that he would now vote against his own efforts and cave to the hate in his party than he has no leg to stand on. Oh boo hoo. Rush should go hunting with Cheney, and leave the rest of us alone. Al Franken got it right in his book - "Rush Limbaugh is a Big Fat Idiot". It's about time Mr. Limbaugh took some heat. He has been spewing, "You Democrats this. You Domocrats that." for years. Mr. Limbaugh, it is YOUR party who has been in control for the last years who has caused this mess. Rush is the best hypocrite ever... no one gives a flip about him... it is a brilliant add by Obama... the truth hurts huh, Rush... you could take some pain killers to make it go away, right??? The repugs are crying ?? You MUST be joking !!!! Well, he who lives to fight to the bitter END wins the fight. The Obamaniacs are the sleaziest bunch of liars I've seen in a long time. They beat the Clintonistas from the '90s hands-down with their political BS. So now the McSame campaign cannot tolerate some sence of humor?? Where have you been McCain? Obama is just following yopur steps and introducing some humor – get alive McSame/Rush! Taste your medicine and see how it tastes! Limbaugh shouldnt have said the words if he didnt want them used in a commercial. Tasting your own medicine isnt that good...is it Mc-weekend-at-Bernies? McCain has proven yet again he is not only out of touch with a majority of Americans, but out of his mind. He ought to seek medical attention immediately because it's apparent that he is suffering from Alzheimer's and doesn't consider Spain an Ally of the United States. Keep opening your mouth Senator.. maybe before election day you'll be able to put both your feet and Sarah Palin's in there. Obama is a racist in the truest form. He has no right to be running for president of this country. To bring race into this already battle field you call a campaign,he can not be trused or fit to run the United States of Americia. Limbaugh only cares about the party he doesn't like McCain. Which is why we don't need another republican in the White house. 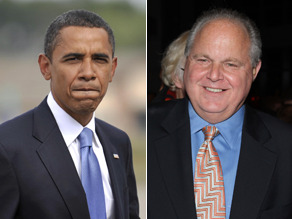 Limbaugh is only afraid of an Obama administration and the implication it would have on his lively hood.